This summer the White House joined Spotify when President Obama hand-picked 39 songs to create two playlists for both “day” and “night.” Named The President’s Summer Playlist, the collection of songs includes musicians such as Van Morrison, Ray Charles and Canada’s own Joni Mitchell. 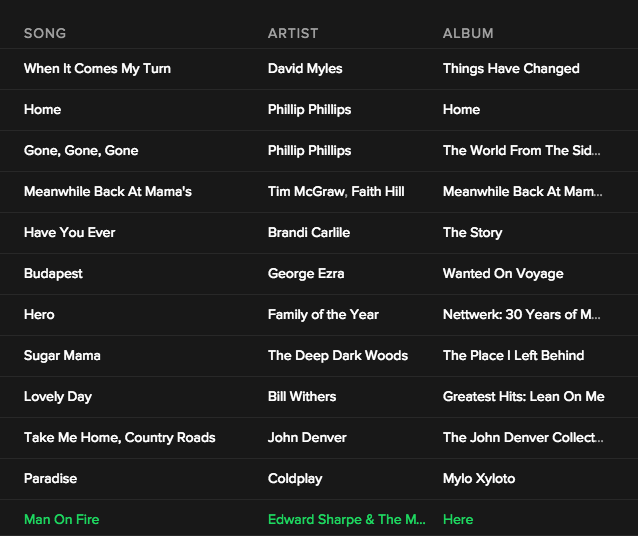 Here at Sarilia, we were inspired to create our own Spotify playlist of songs we love and songs that remind us of home. It includes a few Canadian acts like The Deep Dark Woods and David Myles, and some favourites added by our residents. We’ve made it a collaborative list because we’d like you to add your own favourites to it. Spotify is free, you just have to download it to your computer, or get the app on your smart phone or tablet. You can pay for an optional upgrade if you want to avoid hearing ads from time to time. If you already have Spotify, simply search for “Sarilia’s Spotify Playlist” or click here. Have a listen, follow us, and add your favourite tunes!